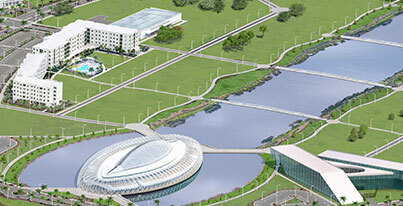 From opening a new Student Development Center to graduating the largest class in Florida Poly's history this is a collection of events that took place at Florida Polytechnic University in 2018. Florida Poly’s Spring 2018 Commencement was held Friday., May 4, at 3:30 p.m., at the RP Funding Center’s Youkey Theater. The center is located at 701 W. Lime St., Lakeland, Florida. All guests must have a ticket (except lap infants). View the 2018 commencement program. 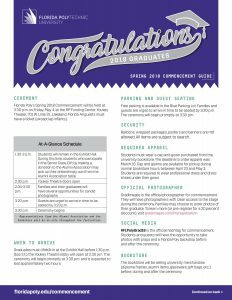 All graduates were required to attend the rehearsal on May 4 at 10 a.m. Students do NOT need to wear their cap and gown for the rehearsal, which is expected to take about an hour. Students must wear a cap and gown purchased from the university bookstore. Cap and gowns are available for pickup during normal bookstore hours, between April 23 and May 3. Students are required to wear professional dress and dress shoes under their gown. All guests must have a ticket (except lap infants). Each student will receive up to six free tickets. University officials have reviewed all requests for additional tickets, and students whose request could be filled were notified. Doors to the Youkey Theatre lobby will open at 2:30 p.m. The ceremony will begin promptly at 3:30 p.m. and is expected to last approximately two hours. Families and guests are urged to arrive in time to be seated by 3:20 p.m. The ceremony will begin promptly at 3:30 p.m. Free parking is available in the Blue Parking Lot. The RP Funding Center is compliant with the Americans with Disabilities Act (ADA). Youkey Theatre events use the Blue Parking Lot and handicap ramp. Assisted listening devices are available on a first come, first served basis. For more information, visit the RP Funding Center website. To request ADA accommodations, individuals should contact Michelle Disson at least 14 days in advance by sending an email to ada@floridapoly.edu or by calling 863-874-8484. Requests received after April 20 will be processed, but the university cannot guarantee those requests can be fulfilled. GradImages was the official photographer for commencement. Visit their website to learn more about the availability of photos from the event. Balloons, wrapped packages, posters and banners are not allowed. All items are subject to search. #FLPolyGrad18 is the official hashtag was used on all university social media accounts. Before and after the ceremony, students, friends, and family will have the opportunity to take photos with props and a Florida Poly backdrop. Take the Phoenix spirit with you. Be sure to visit the Alumni Association table in the Exhibit Hall to join the Alumni Association (membership is free). This is also where you’ll receive your philanthropy cord for participating in the Senior Class Gift. Help the Senior class raise $1,500 to permanently commemorate the Class of 2018 on a campus bench. In the Youkey Theatre lobby, graduates and their families will have the opportunity to leave their legacy on a commemorative engraved brick for a gift of $250. For more information visit alumni website. Other commencement items, including graduation announcements, class rings and diploma frames, are available through Herff-Jones. For more information, contact Tonya Chestnut.